Erin Kuenzig, an attorney from the Michigan-based Thomas More Law Center, is representing a group of anti-abortion demonstrators in Portland. The demonstrators are suing the city of Portland over a 39-foot buffer zone around the local Planned Parenthood clinic, saying the rule infringes on their constitutional right to free speech. Anti-abortion activist Donna Hebert (left) chats with Cha Cha Canady on Congress Street on June 27 at the edge of the buffer zone created around the entrance across the street to Planned Parenthood of New England. Similar buffer zones in Massachusetts were struck down by the U.S. Supreme Court on June 26. 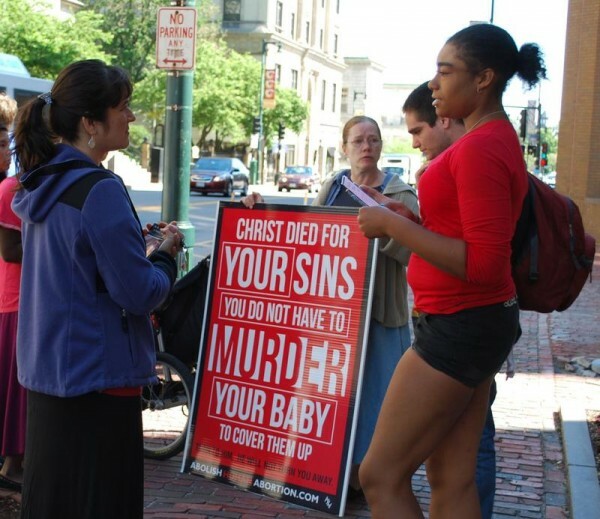 PORTLAND, Maine — Portland’s repeal of the 39-foot no-protest zone around the city’s only abortion clinic won’t likely end the legal drama over restriction of anti-abortion demonstrators in the area. 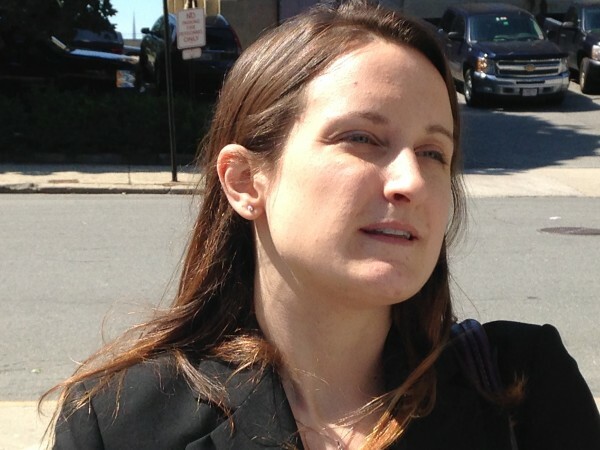 Erin Kuenzig, attorney for the Thomas More Law Center representing a group of anti-abortion demonstrators who sued the city over the buffer zone, said her clients plan to continue pursuing their case in federal court — in part, to send a message that the city shouldn’t try any other buffer zone ideas, either. But while the Portland city councilors on Monday night went through what was considered a legal formality by repealing their buffer zone — after the U.S. Supreme Court struck down similar zones in Massachusetts last month — they didn’t shrink away from Kuenzig’s challenge, either. The councilors declared that they would seek alternatives to the now-defunct buffer zone, just hours after the attorney for the protesters declared they could be taken right back in court for doing so. In the high-profile McCullen v. Coakley case, the U.S. Supreme Court ruled last month that a Massachusetts abortion clinic buffer zone similar to Portland’s infringed on protesters’ rights to free speech and was unconstitutional. On Monday night, the Portland City Council voted 7-1, with Councilor Jill Duson in dissent and John Coyne absent, to repeal its own buffer zone in what was largely seen as a preemptive measure. U.S. District Court Judge Nancy Torresen, presiding over the local challenge, told attorneys from both sides she would likely take her cues from the Supreme Court on the matter, and would be expected to similarly find the Portland buffer zone unconstitutional based on the higher court precedent. However, that’s not where the city council is leaving it. Based on a motion by Duson, the council’s public safety subcommittee has now been charged with coming up with alternatives to the buffer zone and reporting back with new options in September. But some members of the public urged the council to try to fight for its buffer zone despite the Massachusetts precedent. Kuenzig said Monday night’s repeal wouldn’t prevent the city from having to face her in court anyway, at least if her side has any say in the matter. If such a proposed legal scolding doesn’t prevent the city from pursuing another way to push protesters back from the clinic and its patients, Kuenzig said her Michigan-based firm will be back to fight Portland City Hall again. Planned Parenthood of Northern New England, which runs the 443 Congress St. clinic previously surrounded by the no-protest zone, has in contrast urged the city council to find another way to keep anti-abortion protesters away from its patients. The Supreme Court’s recent ruling did not invalidate a Colorado law that places floating eight-foot buffer zones around patients coming and going from abortion clinics there, but in an interview with the BDN last week, constitutional law expert Dmitry Bam of the University of Maine School of Law warned that it could be in jeopardy soon. “I don’t think there are five votes [of the nine Supreme Court justices] to uphold [the Colorado law] today,” he said. Kuenzig has argued in court — and reiterated Monday — that the city can enforce already standing laws preventing street harassment and disorderly conduct to ensure patient safety, but that pushing demonstrators 39 feet away prevents them from having peaceful conversations with patients about alternatives to abortion. “All that this [buffer zone] ordinance does is ensure that women entering the city’s abortion clinic only hear one voice in a moment of crisis, and that voice comes from Planned Parenthood — the largest abortion provider in America,” Kuenzig said. But Planned Parenthood representatives and patients have told the city council they didn’t feel the demonstrators were interested in peaceful conversations, and the no-protest zone was necessary to preserve patients’ legally protected rights to access healthcare.